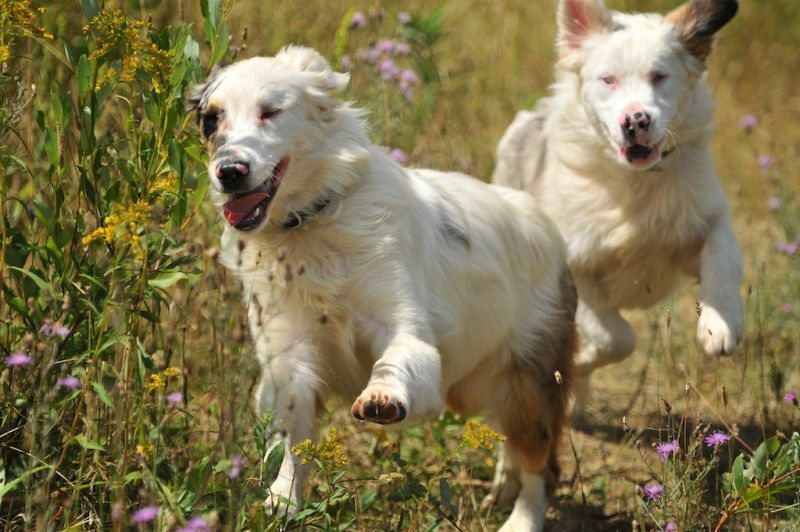 Flurry and his brother Winter were two Australian shepards who were born with birth defects and came to Home for Life® from a rescue in Illinois. The two brothers were turned into a shelter by a good Samaritan who found the puppies at age four months abandoned on a country road. Initially, the shelter asked us only about helping Flurry because he was the less disabled of the two puppies. Both pups were hard of hearing but Flurry could see from one eye. Winter was deaf and also had impaired sight in both eyes. Australian Shepards affected with blindness and deafness are known as “lethal whites” because they're often culled by breeders at birth.When we agreed to help Flurry( who was called "Wonder by the shelter), the shelter then raised the possibility of our also helping Flurry’s brother -who was Winter( known as Charles at the shelter). We couldn’t see splitting up the two brothers: they had been left on a lonely country road, and then spent two months together at the shelter. We said we would help them both. The puppies arrived at Home for Life when they were six months old and were inseparable, Winter always following his more able brother as seen in this photo.. Together they completed the Renaissance Program when 14 months old, and were on their way to becoming therapy dogs when Winter passed away on the eve of our spring brunch fundraising event in 2009. It was a shocking and devastating loss as he was supposed to walk in the dog parade a feature of all Home for Life events. I don’t know how I managed to explain to his poor Renaissance student that his dog had died; he had worked so hard for weeks to train Winter using hand signals and was supposed to walk with Winter, in the parade. We brought another dog for the student to walk with in the parade but it wasn’t the same. Shortly after the event, the student ran away from Boys’ Totem Town, and was still a fugitive when the session ended. I like to think if Winter hadn’t died the kid would not have run away because he was so proud of the progress he and Winter had made with training and was looking forward to graduating from the program. When Winter died so unexpectedly and suddenly, we wondered how Flurry would cope. But he was the stronger and more capable of the brothers, and it would've been harder if Winter had lost him rather than the other way around. Flurry knows, as all animals seem to, that life is short and there's little time to mourn. He has made new friends including Dodi a harlequin Great Dane who has epilepsy and another lethal white Australian shepard ,a female named Whisper. Whisper can see but is deaf. Last year Flurry went totally blind, and the decision was made to remove the residual eye tissue, so he can't see but can still hear. If you would like to sponsor Flurry, please click here.